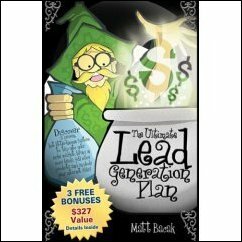 In what is undoubtedly the biggest and boldest move in internet marketing philanthropy, Matt Bacak known as “The Powerful Promoter” and owner of Frontier Marketing International Inc., has teamed up with dozens of other marketers to help him launch his book “ The Ultimate Lead Generation Plan” to their combined 10 million plus newsletter subscribers, with a twist. “Everyone wants their book to be a success and so do I, but I’ve been so moved by the work that Habitat for Humanity has done around the country, particularly in the wake of Katrina, that I wanted to do something to help them. In order to do that, I identified one of the top challenges all businesses have that I could solve (getting leads and traffic to their website, something I do exceptionally well) and wrote a book instructing them in the solution to the problem.” Then Matt did something that is unheard of, he announced that he’d give 100% of his royalties to Habitat For Humanity. But that wasn’t enough, he located dozens of other high profile internet marketers and asked them to donate a product or service he could give to anyone buying his new book. To his surprise more than 200 people responded and the gift package for buying the $14.95 book is now valued at more than $52,127.00 and growing daily. He also got the same marketers to agree to send an email to their subscribers telling them about the book and the donation to Habitat For Humanity. Virtually all agreed and the result is that beginning December 29, 2005, more than 10 million subscribers will be offered an opportunity to buy the book, support Habitat for Humanity and get the massive bonus package. Some critics say that Bacak’s effort is just a marketing ploy to sell books but Bacak brushes their criticism aside. “I’ve been very fortunate to have created a very successful business using the very techniques I’m disclosing in the book and as a continuation of my success I want to give something back. I’ve been profoundly impacted by the work that has to be done in this country to repair the devastation that rained down on us last year. People can think what they will, but the full royalty payments will still go to Habitat,” said Bacak. Anyone who wants to take part in the event can purchase the book at their local bookstore, BN.com or Amazon.com. For more details, visit http://theultimateleadgenerationplan.com.